Paul Connett is the Executive Director of the anti-fluoride propagandists group, the Fluoridation Action Network (FAN). His recent presentation to the Denver Water Board’s fluoridation forum was full of scientific misrepresentations and distortions. I debunked his claims on fluoridation and IQ in the article Connett misrepresents the fluoride and IQ data yet again. Here I debunk his claim that WHO data shows community water fluoridation (CWF) is not effective. 1: Is there a difference between fluoridated and unfluoridated countries? 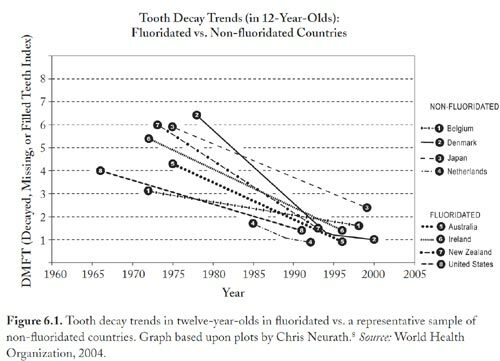 Connett waves around graphs showing declines in tooth decay in some countries but does nothing to support his claim that there is no input from fluoridation to this improvement in oral health. After all, oral health depends on a number of factors so any serious claim needs adjustment for these factors and a proper quantitative comparison. The data in these graphs is just not suitable for this – but lets humour people like Connett who place so much faith in the graphs. I took this graph from Connett’s book The Case against Fluoride (Chapter 6, page 38). It is easy enough to do a ballpark comparison of the average rate of decline of dental decay for the four nonfluoridated countries and compare that to the average rate for the four fluoridated countries. I did this and found the average decline in dmft (decayed, missing and filled teeth) for non-fluoridated countries was 1.4/decade and for fluoridated countries 1.6/decade. On the face of it the decline in tooth decay was more rapid in the fluoridated countries – the opposite to Connett’s claim. Of course, Connett would laugh at such a comparison and claim the data is just not good enough to make such comparisons. And I agree – but isn’t that exactly what he was trying to do? He was simply waiving around a poor set of data which he thinks supports his claim that CWF is ineffective – it doesn’t. He should know that, and he should be ashamed, as someone with scientific training, to make these claims using such evidence. The huge influence of inter-country differences on these data, irrespective of fluoridation, surely sticks out like a sore thumb in Connett’s graphs. That doesn’t require a scientific training to see. These differences introduce so much noise into the data that no conclusion is possible about the influence on fluoridation. The WHO data includes New Zealand and Ireland where there are fluoridated and unfluoridated areas. Cornett’s graphs do not differentiate – the just use the averages for these two countries. Yet, even that sparse WHO data set shows clear benefits of community water fluoridation on oral health. Consider the differences in tooth decay between fluoridated and unfluoridated areas of Ireland. An acknowledgment, of sorts, that his use of the WHO data is wrong in his graphs – but he continues to misrepresent it in this way! The data in the graphs below shows a similar situation for New Zealand – this time using data from the NZ Ministry of Health (which is much more extensive than the WHO data). 3: CWF still effective when fluoridated toothpaste used. Paul Connett’s claim that CWF is unnecessary when fluoridated toothpaste is used was based on a naive interpretation of the graphs he was waving around. The data above for Ireland and New Zealand show that, even where the use of fluoridated toothpaste is widespread, there is still a difference in the oral health of children living in fluoridated and unfluoridated areas of a country. Other research also shows CWF is still effective, even though its effectiveness may, these days, be less than observed in the past when fluoridated toothpaste was not used. But, in contrast to what Connett appears to think, fluoridated toothpaste in not the only factor involved. There is the general improvement in dental health treatments and diet in recent years. Rugg-Gunn & Do (2012) also refer to the “halo” effect – a diffusion of beneficial fluoride from fluoridated area into unfluoridated areas via food and beverages and consumption of water away from the place of residence. The recent data can also be influenced by differences in residence and place of dental treatment. For example, dental treatment and record taking may occur at a school or dental clinic in a non-fluoridated area but the child may live in a fluoridated area. This effect could explain the apparent reduction of differences for New Zealand children from fluoridated and non-fluoridated areas after 2006 in the above graph. In 2004 a “hub and spoke” dental clinics system was introduced where one school dental clinic could serve several areas – both fluoridated and non-fluoridated. Paul Connett’s use of the graphs showing improvement in oral health in countries independent of fluoridation, is on the surface, naive because no conclusion about the effectiveness of CWF can be drawn from this sparse data involving comparison between countries with so many political, social and environmental differences. Connett is presumably aware of this, and of the fact the same WHO data shows a beneficial effect for Ireland and New Zealand. This is another case of Connett using a scientific academic title (his PhD), to give “authority” to his misrepresentation and distortion of the science to local body politicians. Connett, P., Beck, J., & Micklem, H. S. (2010). The Case against Fluoride: How Hazardous Waste Ended Up in Our Drinking Water and the Bad Science and Powerful Politics That Keep It There . Ministry of Health (2014) Age 5 and Year 8 oral health data from the Community Oral Health Service. National Fluoridation Information Service (2011): Does Delayed Tooth Eruption Negate The Effect of Water Fluoridation? National Fluoridation Information Service Advisory June 2011, Wellington, New Zealand. Rugg-Gunn, A. J., & Do, L. (2012). Effectiveness of water fluoridation in caries prevention. Community Dentistry and Oral Epidemiology, 40, 55–64. This entry was posted in dan savage, Health and Medicine, New Zealand, SciBlogs, science, Science and Society and tagged Connett, fluoridation, fluoride, Ireland, oral health, SciBlogs, WHO. Bookmark the permalink. Ken from your Ireland graph 1983 DMFT F 2.5 non-F 3.3 2002 DMFT F 1.1 non-F 1.8. The differences are 0.8, 0.7 between F & non-F, but something else has been far more effective 1.4, 1.5 over the years, about twice as effective as fluoride in reducing the number of DMFT. If the huge input into fluoridation promotion had been shared more fairly with the other factors in tooth health perhaps they would have got to 0.6 F and 1.3 non-F.
Brian, are you trying to excuse Connett’s dishonest presentation of the WHO data by attempting to denigrate the clear benefits of CWF shown in the Irish and NZ data? Does his dishonesty not worry you? Are you attempting to cover up this dishonesty? We all know (except Connett, apparently) that a range of factors is involved in oral health – CWF being just one of them. You describe CWF as a “huge input” – compared with what? Do you compare it with the huge input into social and health care which has positive effects? Far from being a “huge input” CWF has been shown to be very cost-effective – reducing the costs of health care. And no one suggests that CWF be seen as a substitute for other health and social measures. Come on Brian, recognise your idol has feet of clay and stop trying to divert attention away from Connett’s dishonesty. Ken, Connett has been telling people fuoridation is not the answer and so they have to take other means to look after their teeth. Which may have had more effect than fluoridation. I didn’t describe CWF as a huge input. I was speaking of the promotion of it, that promotion budget, financial and personal, diverting effort from more effective dental health issues. More of what has been done to slope that graph down. Brian I realise you find it impossible to comorehend that Connett is ever wrong, or that my debunking of his claims is justified. But read the post above. Listen to the claims he makes in the video clip. Connett is naively and dishonestly using the WHO data to claim that CWF has no beneficial effect – or even a negative effect. The data just doesn’t support his claim. As for you claims of a huge input into promotion of CWF – what about backing it up with some figures? And how can one seperate any advise from health professionals on one aspect of health from the general requirement to give advice on health. Sure, health professionals need to put effort (I think more effort than at present) into countering the lies of people like Connett. But please put blame where it is due. If Connett was no promoting the sort of lies illustrated here there would be no need to divert health dollars into countering it. When he spoke in my hometown he started going off on the benefits of xylitol. He claimed that it made teeth slippery so bacteria couldn’t attack enamel. Here’s the thing, Brian, your hero doesn’t even know how this stuff works and yet he is trying to sell it. (It starves bacteria by giving them “fake sugar” to eat.) He’s trying to sell something that is sold by someone who gives him money to generate paranoia about what comes out of the water faucet. Doesn’t that bother you a little bit? that it may work against ear infections, too, by such means. “your hero.” You seem to be stuck in the two-valued stuff, still, trying to put me in one of two categories. I didn’t say what I I said is happening because of Connett’s approach has been intended by him: that he attacks fluoridation to increase other, better means of improving dental health. I just said it may be an outcome. Ken an example of major input to fluoridation is the people-hours spent on it on openparachute. I feel it is unfortunate that sometimes the focus is on either fluoridation or not fluoridation, and thinking looking other ways is sidetracking, rather than adding value. http://www.umich.edu/~bmsteach/lopatin/salivarygland/lectures/download/Chem_Comp_&_Funct.ppt It reinforces some of the Ritchie material I have referred to before. And you’re right, Brian. Perhaps I shouldn’t have used the words “your hero.” That was a bit immature of me. I’ll work on it. I reported before, DB Ritchie said it is the early pellicle/plaque which rapidly grows which contains acid-forming Strep mutans. The later pellicle/plaque protects teeth from sugar acids/acid fruit. Pellicle acts as a diffusion barrier, slowing both attacks by bacterial acids and loss of dissolved calcium and phosphate ions. Sound surface layer of early carious lesion forms impermeable barrier to diffusion of high mol.wt. inhibitors. Inhibitors may encourage mineralization by preventing crystal growth on the surface of lesion by keeping pores open. Plaque bacteria may produce their own inhibitors. Immobilization may occur in plaque, encouraging calculus formation. PRPs in solution do not inhibit adhesion of bacteria.